Happy Friday all you fab fashionistas! Guess what I’m giving away today!! Hint, it’s fresh off the runway! Yup, it’s the winning look from last night’s “shoes first” challenge on Project Runway. I still can’t believe I was able to get my hands on this sleek little LBD and cape designed by the talented Helen Castillo from episode 7. After getting VIP access to Marie Claire’s fashion closet, the designers were challenged to create a look based around the most important accessory a girl (or boy) could have– SHOES! There were so many amazing designs, but the judges narrowed it down to a chic classic. And one of you lucky lovelies can own it! 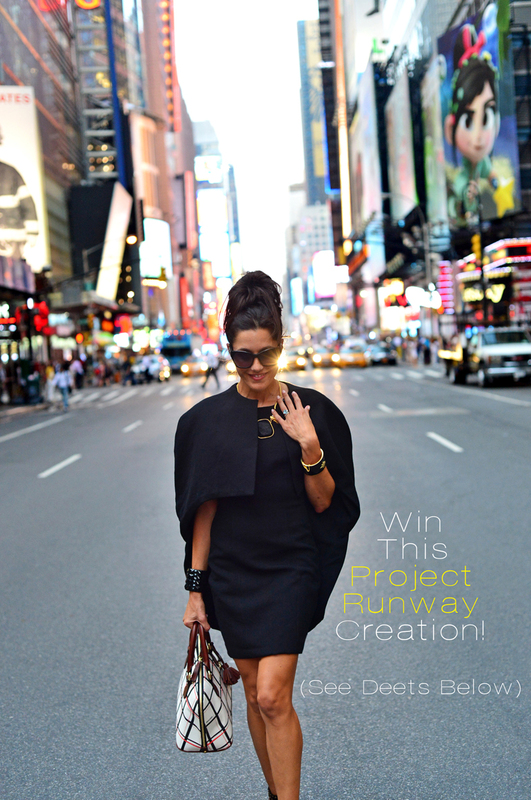 Just follow the deets below to enter to win this one and only original (size 2) masterpiece! 1. Leave a comment on this post so we know where to find ya’! 3. Follow NYCPretty on Instagram too! A winner will be chosen on Monday, September 2nd. LOVE LOVE LOVE these pics! You are a rock star, sista! Awesome pics; you look beautiful!!! I love classic pieces, and this LBD is perfect. The cape just makes it that much more fabulous! I love the necklace that you have on, too! Followed on Instagram under @cxc118! Gorgeous dress and I love the Brahmin bag too! 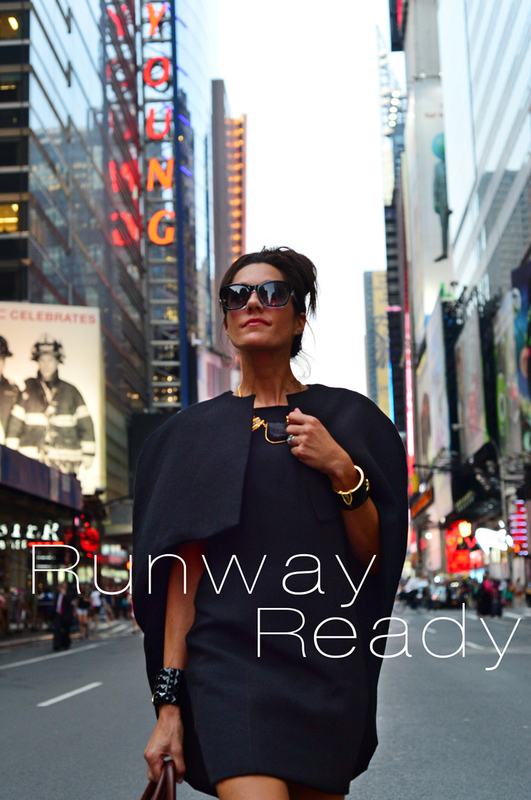 Great dress and the necklace takes it to the runway! I just finished watching the episode, and love this design!!! As an aspiring fashion designer I would love the have this as inspiration and motivation in my closet, and of course to wear it! Thank you for the giveaway! Hope I win!!! Love this dress.. I watched the project runway episode last night as well and fell in love with this dress. love it. anyone who wears it will look fabulous. that’s great design. Very Audrey Hepburn…You look stunning. I love your entire look! xoxo Have a great weekend. Hey Christine, Here I am. I can’t wait to walk the sidewalks as my catwalk in this dress. I did all of the below – hope i win!! Love Project Runway & LOVE THIS DRESS!! Nothing speaks sophistication like a LBD! LOVEEEE I want this whole outfit! Absolutely inlove with this dress and cape! It’s even more spectacular because its from my favorite show! Love this LBD. I’ve reposted commented and liked! Love love love this LBD! Loving this look. Very chic & elegant! That’s gorgeous! LOVE the statement necklace and bracelet too! Next > Fitness Get Served!